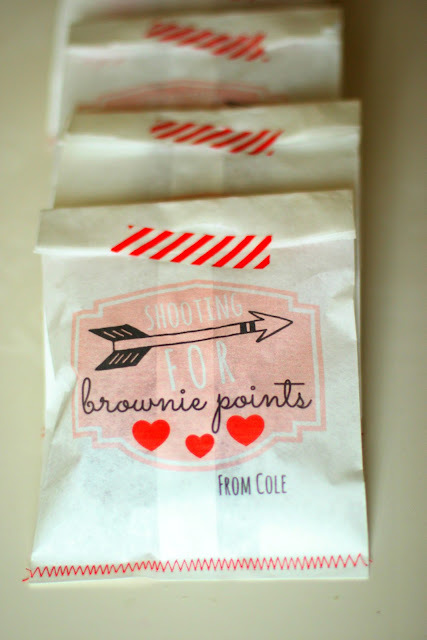 I had so, SO much fun making these valentine's for the boys' teachers. 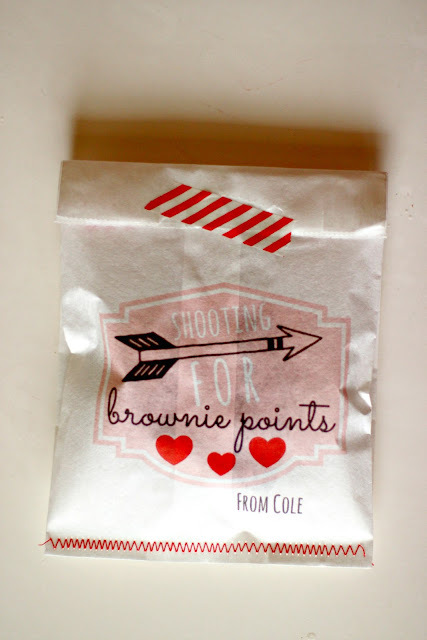 I pinned an idea for using a brownie box mix and a "Shooting for Brownie Points" tag from Lauren McKinsey Designs onto my Valentine pinboard. I really like her tags and the idea was insanely cute. 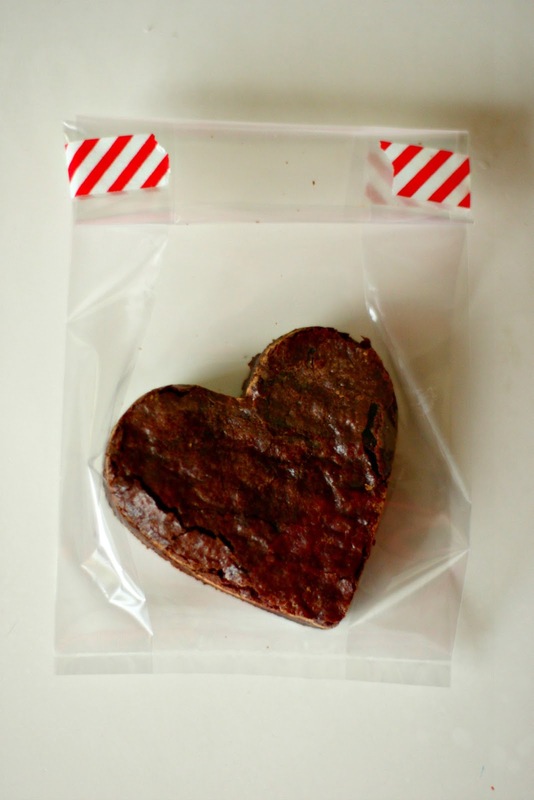 While I loved her idea, I really wanted to make brownies and I wanted to package them differently. I designed a label in PicMonkey, my online photo editing best friend. They have some fantastic Valentine's overlays, like that arrow. SO cute! I had these white lunch bags and I remembered reading somewhere (probably on pinterest) that you could print on lunch bags. 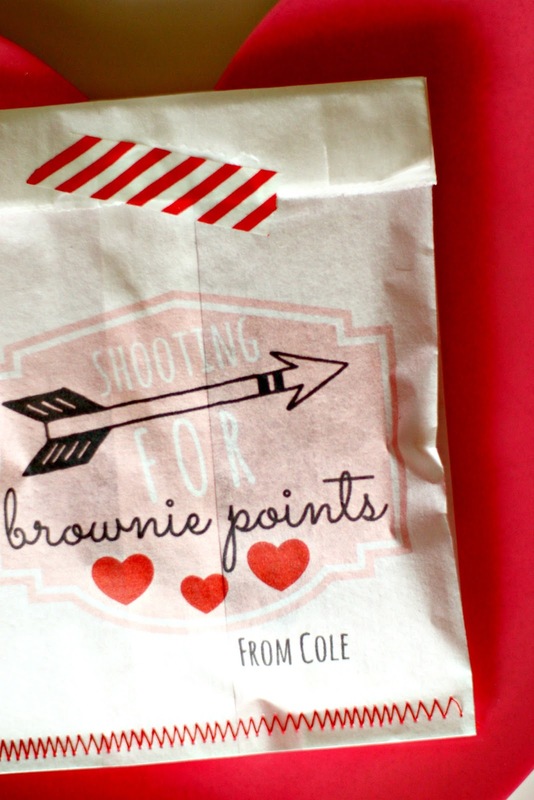 So through some trial and error I figured out how to print my newly made Valentine label onto a white lunch bag. I kind of love it a lot. I will probably be doing this super neato trick again. In order to make it more of a treat bag instead of a lunch bag, I cut off the bottom and then stitched it closed with a decorative zig zag stitch. This is my new favorite recipe and if you keep reading, you just might find the recipe at the end. The brownies are dense and truffle-like. They are rich. They are glorious. 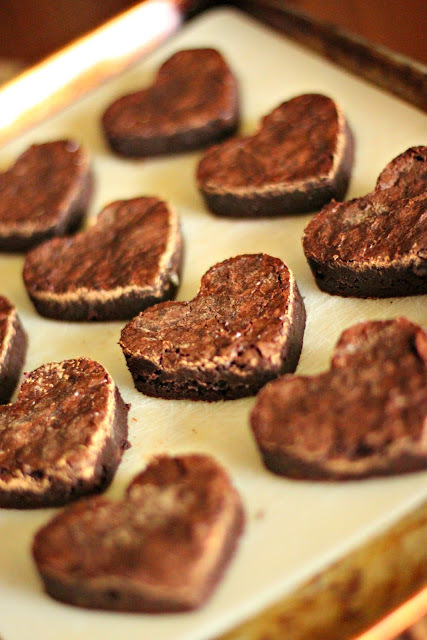 I tripled the recipe and decided cutting out heart-shaped brownies would be perfect. Look at all those delicious and cute brownies. I packed them up first in cellophane bags and some washi tape. Then I slipped them in the paper treat bags. I folded over the top and, again, used washi tape. Now they are all ready for Thursday. Hopefully they will earn my Little Men plenty of brownie points. Did you use Pinterest this Valentine's day? As always, Pinterest is full of ideas. 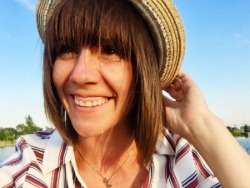 I would love for you to follow along and join me in my Pinterest adventures! And now, I think I promised you a brownie recipe! Preheat oven to 325. 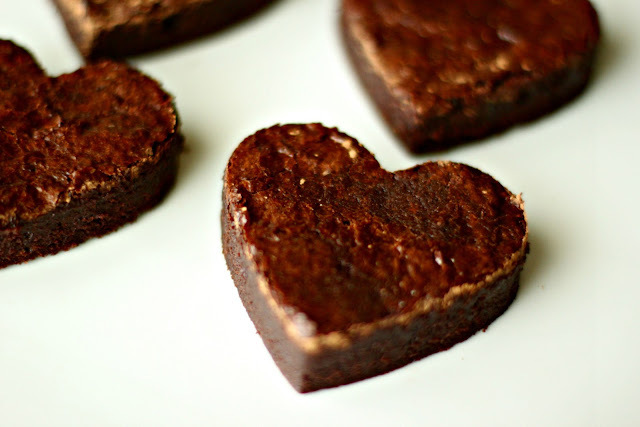 Line an 8x8 pan with foil, with enough excess to allow you to pull the brownies out by the foil when they are done. 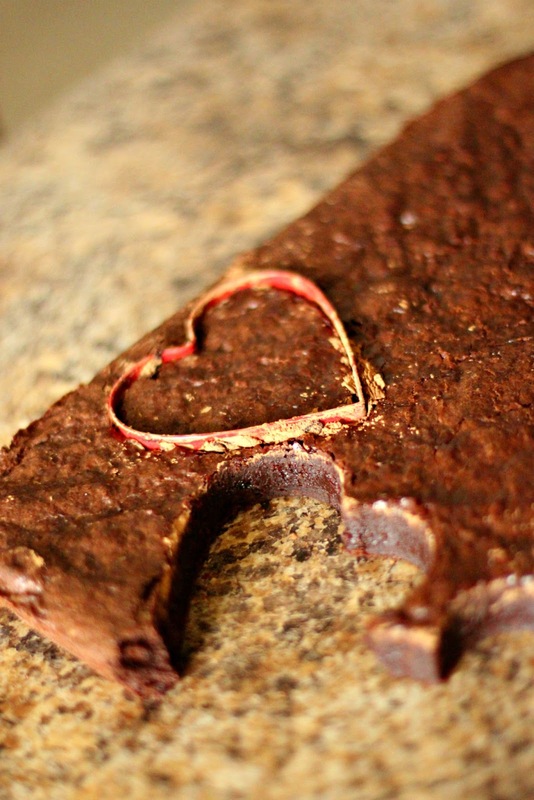 Heat chocolate, butter and water in a microwave-safe bowl for one minute. Stir well. Continue to melt at 30 second intervals, stirring each time until melted and almost completely smooth. Stir in the sugar and vanilla. Next beat in the eggs one at a time. The batter will be smooth and glossy. Next stir in the flour until just combined. Spread the batter into the foil-lined pan. Bake for 35-40 minutes until a slight crust forms on the top.The center when tested should still be slightly moist. Place the pan on a cooling rack and allow to cool for about an hour and then either refrigerate for 2-3 hours or freeze for an hour. When they are set, remove from the pan by lifting out the foil. Then cut the brownies. 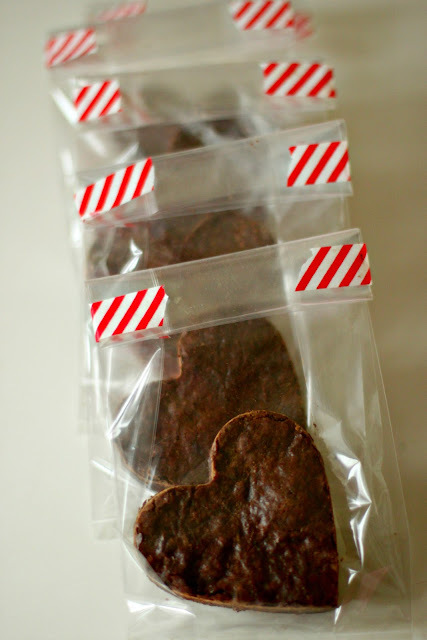 If they are still too tacky to cut, put them back in the freezer for another 30 minutes. Thank you thank you thank you for the teacher treat idea. This I can do. 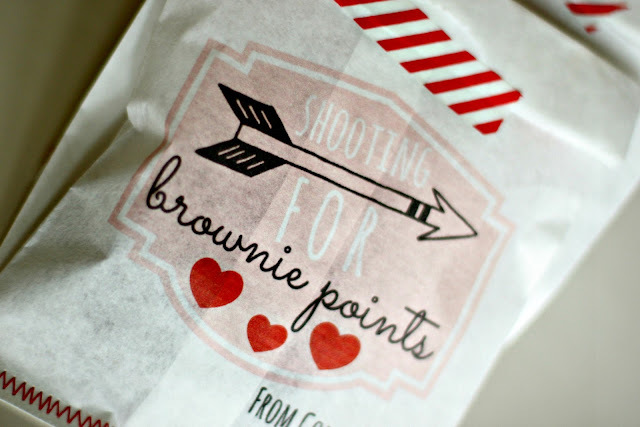 Just created my own "shooting for brownie points" tag on picmonkey.com. Love this idea! How fun! I love the stitch at the bottom! 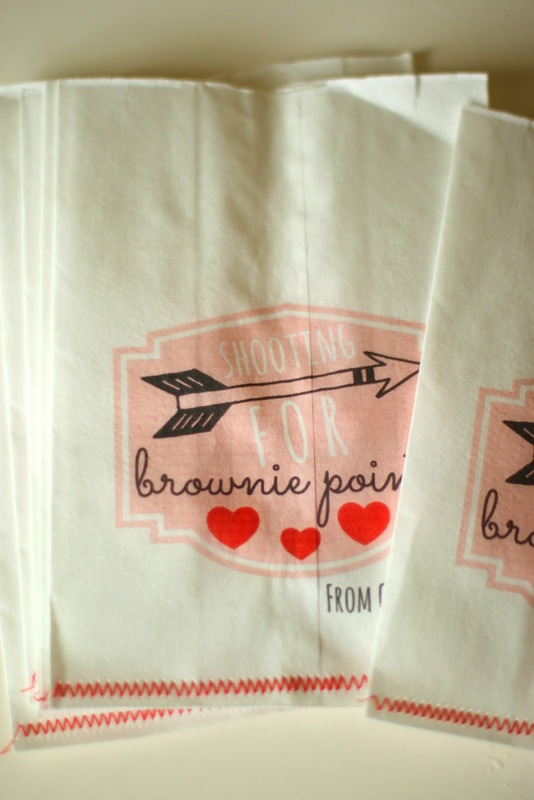 Would love to hear more about the printing on lunch bags idea...tips/tricks/etc....? Laura, it really is kind of trial and error. I lined up the image in word on one side of the page. Then I put the bag in the printer flush to the right. I did have to print a couple of trial bags before I got it right.